Many times in My Word, you read of My angelic host and the various tasks they are given to assist in this realm. There has always been the presence of these holy ones and they have continued to be in My service since creation began. These final hours upon the earth will be no different. There are many different roles, functions, assignments and responsibilities for My Heavenly host and their manifestations in these end times will become more and more frequent. I have told you that when the world becomes darker and darker, you My ambassadors and My lights will shine brighter, and as you rise in spirit and truth into complete unity in Me, you will witness great signs, wonders and miracles, these to include the appearance of My mighty ones. I will never personally leave or forsake you, nor will I suffer My righteous ones to be moved. I have dispatched My angelic host to assist you in ways you have not yet come to the awareness of, but come to Me and ask and I will reveal to you how they shall serve. They are ever present now with you, but are increasing in number all around the world, as Heaven invades the earth. Some were purposed specifically for this time of now, to guard against the demonic entities and giants that are now being released, as I speak these words to you. Satan knows My Word as well and has been planning his attack since the beginning . He will use his demonically possessed army to stand against the King's army and the battle of good and evil will literally play out in front of you. When My Word speaks of men's hearts failing them for fear of what is coming upon this earth, it is not only the judgments which will cause hearts to fail but also the unimaginable manifestations of evil incarnate that seek to devour the souls of men. Because unrepentant men refuse to humble themselves and come before Me and repent, I have turned their hearts to stone and given them over to their evil desires and reprobate minds. What has been done in secret-- secret pacts and ungodly covenants will be brought to the light and all things that have been hidden will be exposed. Giants, hybrids and men of renown have already begun to appear all over the earth. Just like My heavenly host, so too will they increase in number. Many now walk among you who are not as you are and not made in My image. They are soul-less and without ability to display fruits of My Spirit, as they are not Mine. You who know Me and walk with Me will have the discernment to recognize them for who they are. Be not afraid My people and do not be deceived. It is of the utmost importance for you to heed My instructions and come to Me for further revelation concerning the things I am speaking to you about. The enemy will send these beings to some of you to ensnare you and deceive you but no harm shall come to My chosen ones. In times of calamity and great distress, many things will be happening amidst all the confusion, but you will only know My peace and My safety. Pray for and then practice great discernment at all times as I teach you and all will be well with you. I tell you these things because you are My own, and I wish you to be as prepared as you are able, as the events will come upon you so suddenly. There will be no time to think on these matters as the judgments come and all is chaos. Ask Me to write My laws upon your hearts and to bring all to remembrance when you are in need, and I will grant this to you. There has never been a battle previously that resembles this one which is about to take place. Not only do the nations prepare for war, but all of creation is at war-- the epic battle of good against evil..
sight as grasshoppers, and so we were in their sight. earth: for the powers of heaven shall be shaken. understand with their heart, and be converted, and I should heal them. another; men with men working that which is unseemly, and receiving in themselves that recompense of their error which was meet. teach you all things, and bring all things to your remembrance, whatsoever I have said unto you. BEHOLD I COME DVD'S AND COMPLETE PDF FILE FOR ALL MESSAGES NOW AVAILABLE! 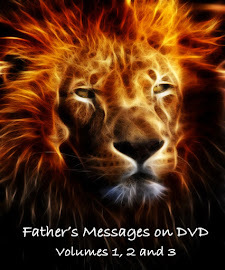 We are very excited to let you know that you may now order Volumes 1 and 2 of Father's youtube messages in DVD format. If you are not familiar with our youtube channel, it is titled Behold I Come as well. The links are over on the right side of this page. You can order directly from the company Kunaki and have them sent to your designated address for a nominal fee. We hope that you will take advantage of the opportunity to use these messages in video format to distribute to as many people as you can, as a way of spreading the gospel of Yahushua and the urgent times that we are living in. Talk to your pastors/priests/leaders at church and bible study groups and consider asking them to purchase multiple copies, to distribute freely, to those who do not have the means to pay the small fee online. We have also provided on the right column, directly under the video boxes, under the PAGES tab, the PDF file for all of Father's messages from 2012-2018. We encourage you to print these as you are able and share them as the Holy Spirit leads you. Please download the file and save it to your devices so it will continue to be available once we no longer have internet. Thank you for all your support and prayers, and our prayer is that millions, even billions are reached for the Kingdom through our combined efforts to share the love of our King! He is limitless and all things with Him are possible! Please join your prayers to ours, and have great faith at how many of the lost and lukewarm can still be reached!! El Olam speaks. I am everlasting to everlasting. I am He who has no beginning and has no end-- Limitless and Infinite, Eternal and Sovereign. I desire that you would deepen your understanding. The compilation of your experiences here in this lifetime are to bring you to the point which I will call 'the eternal moment of now.' When My Word teaches you that you are to abide in Me, there is a deeper understanding to that which I desire for you to learn. When you abide in Me and I in you, there is only that-- spirit in spirit, in love, in the center of My heart, in the moment of now. Time is only existent in your construct here and is linear, moving in a progression from point to point, with an understanding of a past, the time of now, and a future. When you truly come to Me in unity, your spirit is drawn back into harmony with My Spirit, and you will have the understanding that I (We) exist outside of the parameters this world operates from. With Me, in Me, there is no past, present, or future. There is only the moment of NOW, as I am Eternal-- no beginning, no end. It is 'time' for My people to transcend the limitations that the enemy has placed on you, and come to the understanding that the door is open unto you to My Kingdom and to all I AM. My heart's desire now is for you to come to this understanding, for as My heirs, My kings and My priests, We are going to set this world ablaze with a glory and anointing that has never been known. You are an essential part in establishing and anchoring My presence here in these final hours before My return for you. DANCING WITH YAHUSHUA OUR KING!!! This message was received on August 4, 2018. It happened during a conversation I was having about family members being together in Heaven. As Father often will, He began speaking right in the middle of the conversation, commenting on what we had been talking about!!! He is amazing, and my love grows for Him moment by moment... At times I can hardly stand the anticipation of what it will be like to be in His presence for eternity... I am truly in love with My King and filled with so much excitement for His arrival!! While He was imparting this, I was being shown how we were dancing and laughing with our beautiful King and experiencing so much joy in His presence! Although this was a private word at the time, since praying this past week about this message, I have received confirmation that this will encourage many people and I am to post it. I rarely speak anything personal on these posts, as I desire with all my heart that you hear, see and experience Yahushua, Our Father and His Holy Spirit only- deep speaking unto deep. However, this time I want to share a bit. I want to encourage you and give you hope. Do you remember when Yahushua told us not so long ago in one of His messages that we would know how close He was because our spirits would know? He said we would have experiences and manifestations that were not like before, and He would make Himself known to those who walk with Him. He is ever so close now.. as He is showing me things and manifesting in ways He has not done before. His presence at times comes in like a rush, and more often than not, I am seeing and feeling Him in the spirit right next to me on my right side. I have always felt Him with me, and knew He was there, but things have shifted very recently. He is much more present now than before, and He is openly conversing with me throughout my days. He is telling me to look for His gifts that are everywhere, and He is about to shower His Bride with blessings like never before. I can see Him in the spirit smiling on many days, and sometimes I now see Him laughing for joy.. He's so excited to come for His Bride!!! When Father is present, there is a kind of rush in my spirit that then will manifest in my whole body. He usually draws close and then moves back a bit, but now He is standing on my right side and He is so close that I sense Him breathing in my ear. I can describe it as when someone comes up behind you. You sense the person, but you don't yet see them. This is happening more and more, and My spirit has shifted up, like shifting from 4th to 5th gear, to a higher vibration... It's wonderful but it is no wonder it's sometimes hard to sleep!! I pray you are blessed as I share this experience with you. Yes! You will be together with Me always, and you will also be doing other things for Me as well. You are My kings and My priests, and because of your knowledge and revelation and understanding here, you will be brought directly to Me and be side by side with Me. You will govern over much, as you have been given much responsibility because of your obedience here. This experience here on earth is only the tip of the iceberg! You have only scratched the surface of the beginning of your journey with Me into eternity, into love itself! When you arrive in heaven, We will dance and play.. yes, PLAY! and laugh and rejoice together, oh, We will have so much fun! You have never known fun and happiness like you will have here when We come together in My Kingdom. I wish you would be laughing and jumping for joy at what I am about to do!! I am the complete and ultimate expression of love. I am comprised of total and perfect love. My love is eternal and My love is limitless, ever-expanding and all encompassing. When I bring you from this temple and you are transformed, you will enter into My perfect love without the curse of this fallen nature, and from there you will ever be drawn and carried from one aspect of My love to another aspect, the very essence of My being, each time being fully immersed into a higher and deeper capacity within your spirit to be absorbed into this love. Hence My words, I move you from glory to glory. In Me, and in all My creation breathed forth from the very essence of who I AM, there is only love. Love is everything. Love is all things. Everything in My Kingdom feeds from the depths of My great love for My creation. Love is what holds each one together as One, because in Me, there is no separation. All are One. All is love. All that comprises My Kingdom is driven by My love, fed by My love, nurtured in My love, held together with My love. So you see, you who walk with Me now have already entered into this great mystery! I have already begun the process in you, moving you from glory to glory. I have given you access here and now, and as I pour out My Spirit now in these last days, you will be given the experience of My Kingdom here in your temple on earth before I bring you home! I just wanted to send out a few updates about things that are happening with our ministry! If you are not already a subscriber on Youtube, we just posted a new video, so please subscribe and send our channel to everyone you can. The title of the most recent video is "THE STORM IS HERE." Thank you! 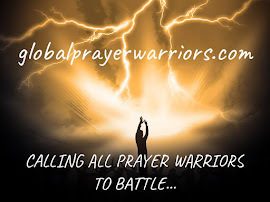 It is also on my heart to send a reminder out to everyone to please remember to make prayer requests on our new global prayer website, globalprayerwarriors.com. My family and I are so excited about this new site, as several months ago Father gave me a detailed understanding that this would be a place where the body of believers would unite in Him, closer than ever before through the most powerful weapon we have in Our Father - PRAYER. This site offers you the opportunity to post your prayer requests and petitions so that all those around the world can join together as one heart in Father, interceding for each other. You will also be able to let others know when you read and then pray for a request. So please check the "I prayed for you box," so everyone participating can be encouraged in knowing that others are praying for them. Also, please pray about being involved in the 24-hour prayer calendar by choosing one hour during the 7-day week to pray for the lost. You can sign up by sending an e-mail to meetmeinthegarden4prayer@protonmail.com. Father's heart desire is that at least one of His children is praying with Him every hour of every day for those who have not yet chosen Him as their Messiah. Our goal is to have several people praying in The Garden with Father around the clock so that there is always someone praying 24/7. Thank you for your support! We are also very close to being able to provide a complete pdf file for all of Father's messages so you can print and distribute them more easily. We are also working on updating the Amazon Kindle books to include additional volumes so that all the messages can be accessed in this format. Additionally, we would like to announce that you will be able to acquire very soon, DVD's of the Youtube video messages, and we will put a link on the blog site where you will be able to order as many copies of the messages in video format that you desire to have for personal use or to distribute as a way to spread Father's words to all of His children. I will announce these exciting additions as soon as the links goes up, so please keep checking back for the latest updates! Lastly, it has come to my attention that some individuals are taking credit for messages I have been given, or are putting a different person's name as the author. Others have put my name on messages that I have not been given at all, and many times the name of the message title has been changed, and the scripture I have listed for that message has been removed. If you read/watch a message that is posted as being from Father through me, please confirm that I have directly posted it on this blog site. I will always only post on my personal site alone, but have given permission to copy messages if nothing is altered and the scriptures are included. If you can't find the message on Behold I Come, there is a good chance it is not mine, or the message has been altered. There is so much deception out there now, so please be very careful and use discernment when reading or watching anything concerning Father's prophetic messages. Thank you! And finally, please also pray about supporting this ministry, as you are led. We appreciate with all of our hearts, your help in order to continue this calling we have been given. To all those who have or continue to come along side of us and provide financial support, may Father greatly bless and reward you for your obedience. We are truly, truly grateful to you and your families.